The Classical labyrinth, is a common design in surviving pictures from ancient times from many parts of the world and is considered spiritual by some people today. Although there are some variations in the design, by far the most popular was the Cretan design, so called because it even reached official state use in ancient Crete, being used on the obverse of some Cretan coins. Most of the ancient designs are curved and approximately circular or kidney shape but I've drawn a square version so that the boundaries between the wall and the path can be completely precise & clear on a computer display with square pixels. 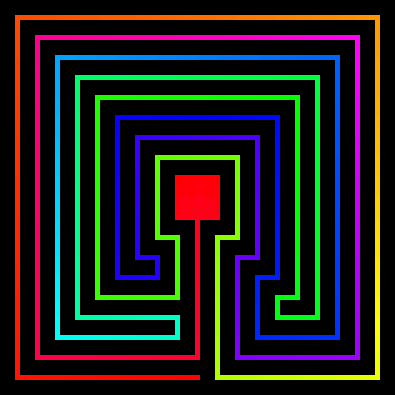 The basic square Cretan labyrinth with the path progressing from red at the entrance through the spectrum ending back on red in the centre. The path & the wall are the same width for maximum symmetry. 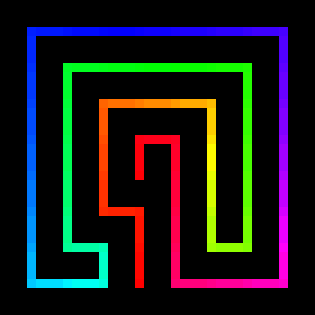 Creating this image was my goal when I first decided to produce large scale artwork from my labyrinth filling program (it originally being intended just to produce one icon) so almost all the other images in this collection can be considered extensions & derivatives of this. Although I originally intended the path & wall of the labyrinth to be of the same width, I found that reducing the path with with respect to the wall makes it look more classy. Alternatively increasing the relative wall width makes look more jolly & colourful. A greyscale colouring, from black to white, is a bit of a come-down after the colourful spectrum ones but I include it here for personal reasons. 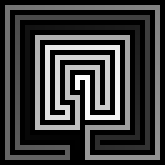 This collection started with me trying to produce a 'favicon' for website and realising that a square Cretan labyrinth would just fit in the 16x16 pixels available but there was no space for the walls so I thought that tracing the order of the cells by progressing from black to white would work. It did not. 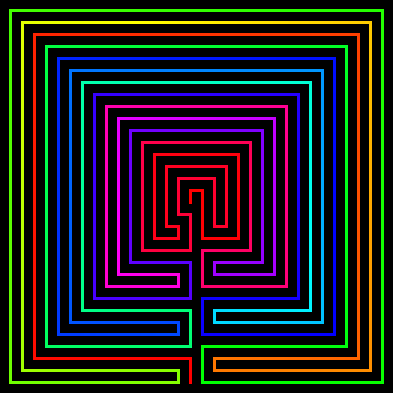 The result was this " " splodge which would be difficult for visitors to even recognise as a labyrinth so I did not use it but developed the program further for less useful but more attractive artworks. Back to spectrum for variants on the fundamental basic Cretan design. In this variant I have added a shortcut out from the centre back to the start (which is sometimes done for walk-through labyrinths as it stops walkers having to retrace their steps after reaching their goal and colliding with people still going in) and joined the start to the end. On the spiritual side one could say that this represents some cyclic aspect of life or the universe but my reason was just that it looks mesmerically pretty when the spectrum is animated to flow around it. The Cretan labyrinth design is naturally expandable as it consists of two repeats of the same path folding. For this version I doubled it to four repeats. 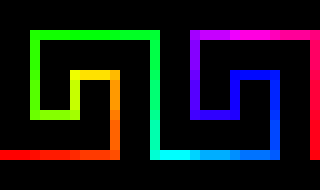 The result is bigger but, in my opinion, less satisfying as it one cycle through the spectrum is insufficient to clearly differentiate the paths in colour. Similarly, the Cretan labyrinth design can be halved down to one repeat of the path folding. The result is a very simple design but I find it pleasing in a minimalist way. 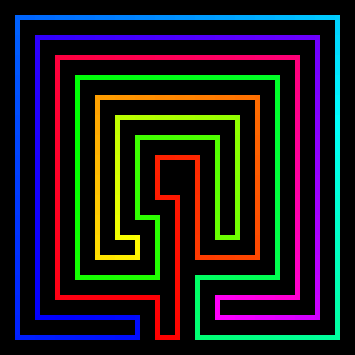 A 'meander' in this context is a path is like a labyrinth but one that ends on the opposite side to the start instead of in the centre. Such paths can chained in a series and were often used as architectural border decorations in classical times. 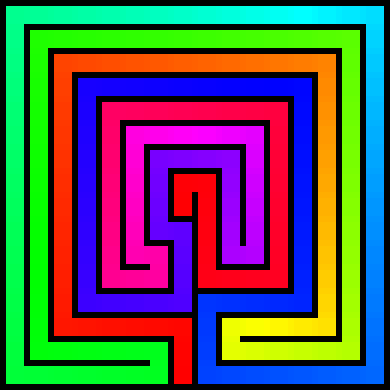 A meander can be converted into a labyrinth by 'rolling'. That is to stretch the shape non-uniformly by pivoting around the end. 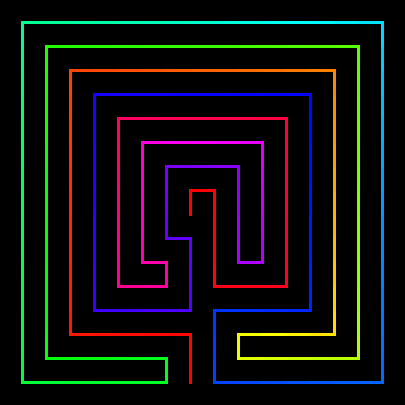 The end becomes the centre, path elements parallel to a line from the start to the end become radial and path elements perpendicular to that line become circular arcs. (It then usually benefits from some artistic tidying up!) Not all labyrinths have meander equivalents but all the main historic ones (Cretan, Roman & Medieval) have. This is the meander equivalent of the basic Cretan labyrinth. It is not very attractive in itself but it clearly shows how the Cretan design is comprised of two identical sets of folds. However, meanders were not classically used individually but repeated as a border decoration and that is how I have used it on this site. The second most common Classical labyrinth design (much less common than the Cretan labyrinth) is the Jericho labyrinth. It is named after its use in medieval drawings of the mythical labyrinthine walls of ancient Jericho (although the type of labyrinth in such drawings varied a lot including also Cretan, alternating & spiral designs). If reduced to 4 circuits, the Jericho is the same as the Cretan consisting of a path which has been folded once then folded again with the second fold folding both layers of the first fold but whereas the Cretan is expanded by adding repeats of that 4 circuit pattern, the Jericho is expanded by continuing the folding method doubling the number of circuits each time. Mathematically expanding the Jericho design is can be thought of as a geometric series and the Cretan as an arithmetic series (albeit with the constant difference between terms having been constructed geometrically). Although I consider the derivation of the Jericho to me more mathematically pure than the Cretan, the result is less aesthetically pleasing because its binary pattern is too obvious. I expect that is a reason for the historical dominance of the Cretan design along with the cross & does construction. I've drawn it as compactly as I could whilst still allowing the folds to all line up parallel to the same radial axis. Unfortunately this resulted in excess space in the centre so I added the central blob (a sanctuary?) to fill that. For more, go up to the Rainbow Labyrinth Gallery home page. Typo corrections 2008/3/4, 2008/9/11 & 2013/8/18.